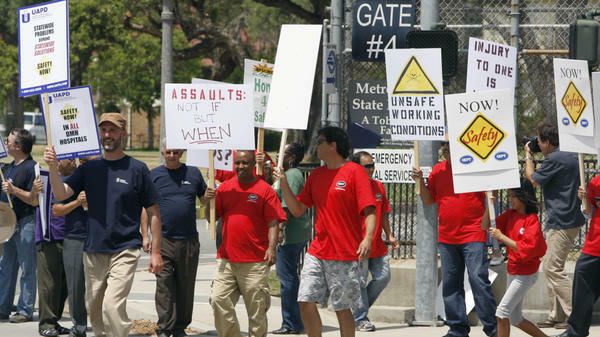 Metropolitan State Hospital employees and supporters gathered outside the hospital in Norwalk, Calif., this summer to protest repeated assaults at the hands of mental patients, and what they called dangerous working conditions. We've been reporting this past year on violence in California State psychiatric hospitals. Thousands of assaults occur annually. Patients attack staff members - or more often, each other. And last year, a staff member at one of the hospitals was murdered by a patient. NPR's Ina Jaffe has been covering this story. This morning she's reporting on the challenge these cases present to the criminal justice system, and she joins us now. Good morning. INA JAFFE, BYLINE: Good morning. MONTAGNE: Remind us, Ina, why this violence has gotten so much worse over the past few years. JAFFE: Well, one reason is that there's gradually been a change in the kinds of patients they treat. I mean, in general, people with a mental illness aren't especially dangerous. But now, more than 90 percent of the patients in California's psychiatric hospitals are committed by the criminal justice system. They're not guilty by reason of insanity, or incompetent to stand trial, and so on. MONTAGNE: And how long, exactly, has violence in the hospitals been on this upswing? JAFFE: It started around 2008. That's about a year after the hospitals began using a new treatment plan imposed by the Justice Department. It was put in place to address what the department called horrifying cases of abuse and neglect. And treatment did get better. But strangely, violence got worse. And now, the Justice Department wants to extend its oversight to two of California's psychiatric hospitals, in part because they say the hospitals haven't gotten a handle on their violence problem. MONTAGNE: But California is not unique, is it? I mean, it's not the only place where the Justice Department has demanded changes in patient care. JAFFE: Well, that's right. The Department of Justice has imposed treatment plans similar to California's, on more than a dozen hospitals around the country. But our investigation found none of these hospitals treat mostly patients who have committed or been accused of serious crimes - like California's hospitals. So the state legislature has been holding hearings on this issue. MONA MOSK: I was assaulted by a person who had been sent to us by prison because that person was so dangerous, they couldn't be managed effectively in prison. JAFFE: Mosk has been working at Patton State Hospital, near San Bernardino, for more than 10 years. MOSK: Now, if anyone came up to you on the street and clocked you in the face, I'm pretty sure they would be arrested. But unfortunately, at our facilities, arrest is something that happens very rarely, although assaults occur almost on a daily basis. JAFFE: The numbers back her up. According to the Department of Mental Health, last year there were nearly 1,500 assaults and other crimes at the hospital where Mosk works. Just 91 of those cases were submitted to the San Bernardino County district attorney for prosecution, and the D.A. rejected 81. MOSK: What we're told repeatedly is, you're not hurt enough; it's not a felony offense. JAFFE: And if it's not a felony, it's a waste of time and resources to prosecute, explains Gerald Shea. He's the district attorney in San Luis Obispo County on the central coast, which also has a large psychiatric hospital. GERALD SHEA: If a person commits a simple battery upon a staff member, that's essentially a misdemeanor. And for all practical purposes, they're not going to get any additional time. And therefore, it doesn't really provide that kind of deterrent and protection for those staff members. JAFFE: But there are cases where the criminal justice system does get involved. For example, there's the case of psychiatrist Alex Sahba. He works at Metropolitan State Hospital near Los Angeles. He told his story to fellow employees at a demonstration to protest hospital violence. Warning: It's graphic. DR. ALEX SAHBA: And another patient came from behind me, put me on a chokehold and simultaneously, as he had me on chokehold, he also bit my left ear. JAFFE: Sahba has no idea how long the struggle went on but eventually, other staff members separated them. His ear hurt like crazy. SAHBA: And I noticed that blood was coming down from my left ear to my left shoulder and body and leg. JAFFE: And then he saw about a dozen patients standing in a circle, staring at something on the floor. SAHBA: And I went closer to see what they were looking at, and it was at that point that I realized they were looking at the piece of my ear that was actually bitten off from my ear and was spat on the floor. JAFFE: Sahba had five reconstructive surgeries. His assailant, Kai Chang, was charged with attempted murder and felony battery. It was Chang's second attempted-murder charge. He'd been found not guilty by reason of insanity on the first one. And for his attack on Alex Sahba, Chang was found incompetent to stand trial - and transferred to another state hospital. MONTAGNE: NPR's Ina Jaffe. And Ina, what do you have for us tomorrow in this series? JAFFE: Tomorrow, we're going to talk to public officials who are trying to figure out how to hold these aggressive patients accountable without punishing people for being sick. Transcript provided by NPR, Copyright NPR.